On April 2, 2019, Sotheby’s will launch its first major auction event for 2019, and it will happen in Hong Kong. The last 4 months have been quiet in the major auction arena, and it is time for the auction houses to start making noise again. 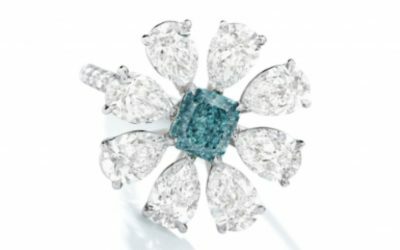 Sotheby’s will celebrate Fancy Color Diamonds during this auction by offering a variety of items; both jewellery as well as magnificent Investment and collectible pieces. We will give you a glance at both worlds (Jewellery and Investment). We shall review them in both categories. 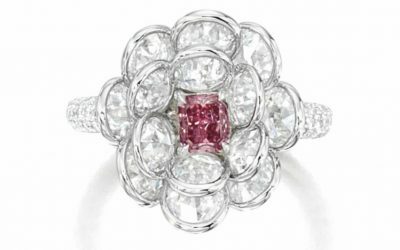 A 0.36 carat, Fancy Deep Pink diamond with an I1 clarity has been set in a ring surrounded by colourless diamonds. The ring is valued between $35.7k to $45.9k total. 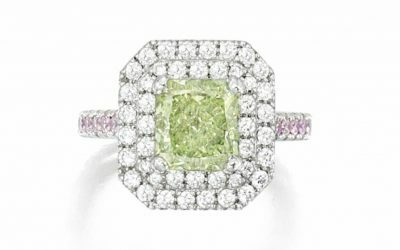 A 2.07 carat, Fancy Yellow-Green diamond with an SI1 clarity is mounted in a ring surrounded by small brilliant colourless diamonds as a double halo with pink diamonds on the shoulders as well. The ring is valued at between $40.8k to $61.5k total. 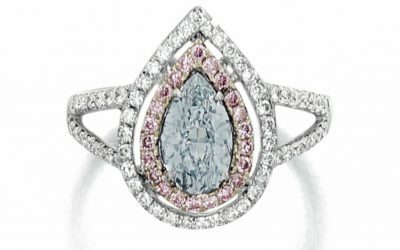 A 0.72 carat, Fancy Light Grey-Blue diamond with a VVS2 clarity is also set in a ring surrounded by pink and colourless diamonds. It is valued at between $19.2k to $25.5k in total. Another beautiful pink diamond is being offered in a ring. It is a 0.23 carat, Fancy Intense Pink with an SI1 clarity. 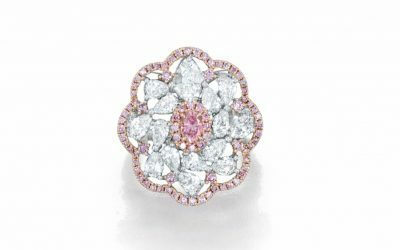 It is surrounded by colourless and pink diamonds. The ring is valued at between $25.5k to $35.7k in total. A 3.31 carat, Fancy yellowish Green diamond with a VS2 clarity is set in a ring which can be also transformed into a pendant. 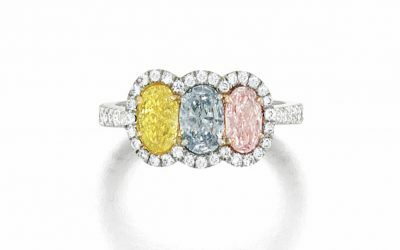 The ring also has pink and colourless diamonds surrounding the centre diamond. It is valued at between $115k to $153k in total. 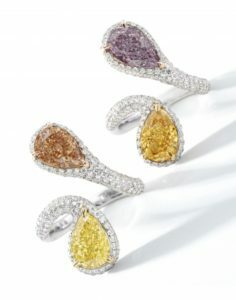 A unique pair of rings that can be worn together or separately has four, pear shape, Fancy Color Diamonds. One ring has a 2.05 carat, Fancy Brown-Orange diamond and a 2.02 carat, Fancy Intense Yellow diamond and both have a VS2 clarity. The other ring has a 2.02 carat, Fancy Brownish Purple-Pink diamond with an I1 clarity, and the other diamond is a 2.01 carat, Fancy Intense Orange-Yellow diamond with a VS1 clarity. 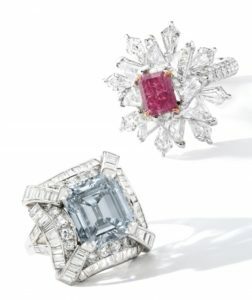 The pair of rings is valued at between $192k to $255k in total. 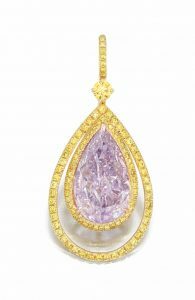 A 5.01 carat, Fancy Pink-Purple diamond with an I2 clarity set in a pendant and surrounded by yellow diamonds is being valued at between $306k to $408k. 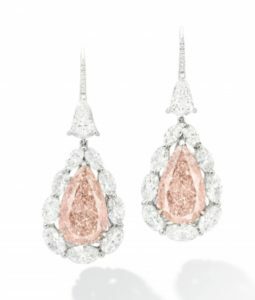 A pair of earrings containing a 6.98 carat, Fancy Pink-Brown and SI1 clarity, as well as a 6.66 carat, Fancy Pink-Brown and Internally Flawless clarity are surrounded by colourless diamonds. The pair of earrings is valued at between $590k to $765k in total. Another pair of earrings are offered, but this pair has a 2.15 carat, Fancy Vivid Yellow with a VVS2 clarity as well as a 2.08 carat, Fancy Vivid Yellow with a VVS1 clarity. Both diamonds are round brilliant. The estimate for this pair of earrings is between $128k to $166k total. 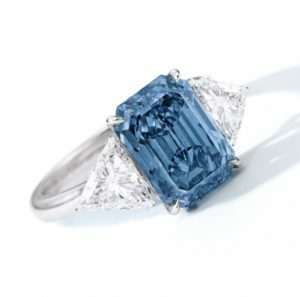 A 5.20 carat, Fancy grey-Blue diamond with a VS1 clarity is being offered in a ring. It is valued at between $230k to $357k in total. A 1.16 carat, Fancy Vivid Purplish Pink diamond is surrounded by colourless diamonds and set in a ring. the pink diamond has an I2 clarity. The ring is valued at between $243k to $319k in total. A 1.21 carat, Fancy Vivid Green-Blue and an SI1 clarity is offered. This diamond can be considered both a collector’s item as well as a suitable investment diamond. This is due to its balance between Green and Blue colors as well as because of its Vivid depth of color. It is quite rare. It is valued at between $795k to $895k total or $657k to $740k per carat. 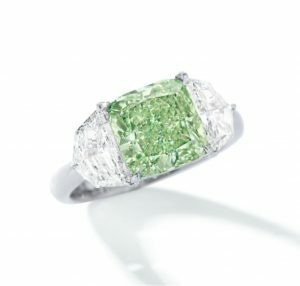 A 3.05 carat, Fancy Intense Green with an SI2 clarity is being offered for $625k to $830k total or $205k to $272k per carat. 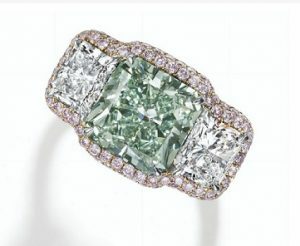 The current record holder per carat for a Fancy Intense Green diamond under 5 carats is the 4.42 carat, Fancy Intense green sold on June 20, 2017 at Christie’s New York auction. The record is just under $287k per carat. That diamond had a VS2 clarity. A 2.56 carat, Fancy Vivid Blue diamond with an I1 clarity is being offered. 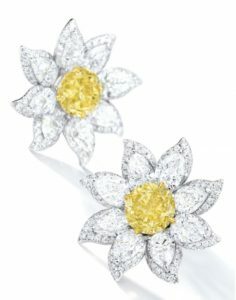 It is valued at between $2.68 million to $3.57 million or $1.05 million to $1.39 million per carat. 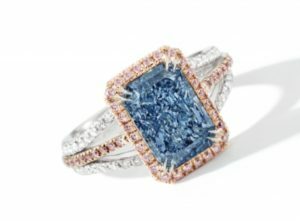 The current record holder for the 1-3 carat sub-category is $1.663 million per carat, which was set by the 2.10 carat, Fancy vivid Blue diamond with a VS1 clarity on April 17, 2018 at a Christie’s New York auction. If a new record is broken, then there are many consequences to this. Let’s see what happens. The star of the evening is a 3.32 carat, Fancy vivid Blue diamond with an Internally Flawless clarity; a true rarity! 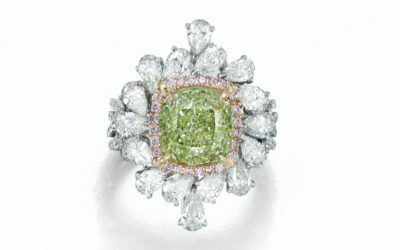 It is being valued at between $5.87 million to $7.65 million total or $1.77 million per carat to $2.3 million per carat. The current record holder for the 3-5 carat sub-category is $2.76 million per carat being held by the 4.29 carat, Fancy Vivid Blue with Internally Flawless clarity sold on November 29, 2016. There is a slight difference between a 3 carat and a 4 carat size, but let’s see what happens during the auction.